Once again we were gifted with some beautiful farm-raised chickens that topped out at 5.3 lbs. What a treat from Patrick and Shannon along with pork goodies and a whole quart of honey! You may remember the last time we had one of these luscious birds. Once again, I wanted to make these birds special – it’s funny how reverent I am when I know the time and energy it took to raise these birds – 35 years ago, when we raised them ourselves, I could’ve cared less. This round I was going to make each of the birds with a different recipe, but we liked this one so well we did it twice. Using a dinner fork, poke holes throughout the chicken this will allow the brine to really soak in. Stir vigorously to dissolve. Place chicken in an extra-large ziploc bag, place in large pot and pour brine over bird. Let sit in fridge for 12-24 hours. Stuff cavity with spent lemon halves from mop sauce. Cover the Dutch oven and roast for 25 minutes. 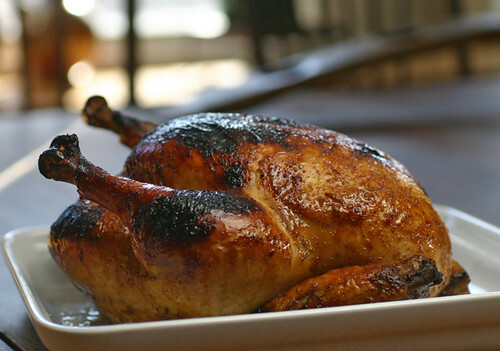 Increase oven temp to 450°, uncover and roast until chicken reaches internal temp of 165° – about another 35-50 minutes. Baste with Mop Sauce every 10-15 minutes. Occasionally check to be sure there is liquid in the pan, add more if necessary. Cut the chicken into serving pieces and serve with pan juices – optional to thicken with corn starch. This looks delicious! This recipe reminded me of the time my mother accidently FRIED her chicken pieces in HONEY thinking it was shortening (1970’s)….in her defense it was a type of honey that looked the same. Don’t ask how she made it work but it was wonderful and never to be made again.